More and more families are personalising funerals and making them a celebration of life and fond memories. With these changing times, increasing numbers are also looking at more environmentally sustainable funeral arrangements such as natural or eco-friendly burials in established woodland or on private ground. 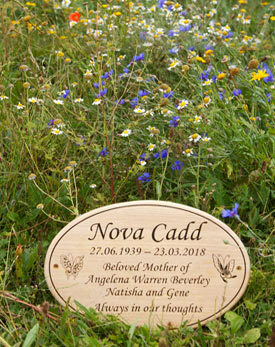 There are acres of beautiful English woodland where eco-burials are available, offering a resting place abundant with wildflowers and wildlife. With the array of different natural materials available to create memorials, there’s going to be something suitable for everyone’s style. * As long as certain guidelines are followed to avoid potential public health risks, there is no law against being buried on your own land. But do check there are no covenants on the deeds to prohibit this. * Compared to a conventional funeral, which can cost £3,000-£6,000, a natural burial can be considerably less. * Rather than a traditional solid wood coffin, consider one made from a mix of 80% waste wood and 20% FSC-certified wood with a biodegradable cotton lining. * Whilst wicker and cardboard are the mostly commonly thought of alternatives for coffins, it is possible to be buried in wool, bamboo or even banana leaf. * Bio-degradable urns are a thoughtful option. By putting the seed of a tree inside the urn, as the urn decomposes, the tree flourishes as a permanent reminder of the life of a loved one. 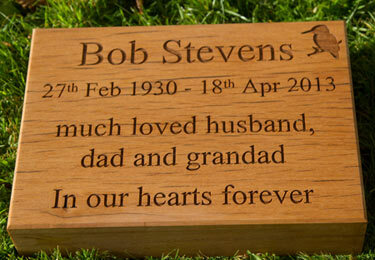 * Opt for a natural stone or wooden memorial, to be in keeping with the environment.